Once you've sorted out the basics in your shower or bath (shampoo? check. body wash? check.) there's always a little room for some specialized products to pamper yourself with. At least that's true if you are me. I'm not a big bath taker these days--to make a long story short, my cats love to hop into the bathtub and I don't want to have to scrub my tub everytime I want to take a bath--but all of these products are great in the shower, as well! The L'Occitane Almond Shower Oil not only smells delicious (like almonds, duh) but it is amazing when used as a shaving oil. It results in a far, far better shave than using a traditional shaving foam. It's a bit on the pricey side, but you can often find L'Occitane kits that will contain this along with some other products to make it a better deal. 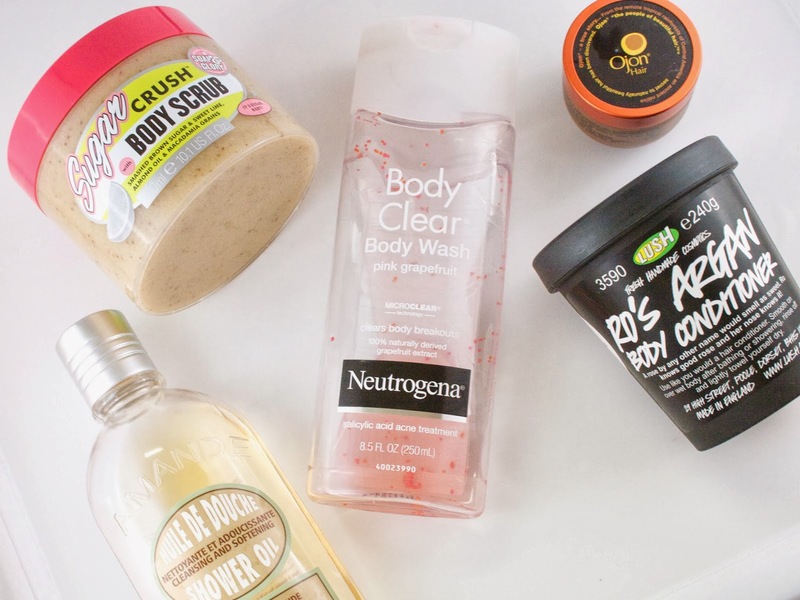 The Soap & Glory Sugar Crush Body Scrub is a brand new addition to my arsenal, but I've used body scrubs from other brands for years! I don't like to use physical exfoliation on my face, but I do love the effects of exfoliating my arms and legs with a scrub. This particular scrub is the best smelling thing I have ever used. It is made of brown sugar, sweet lime, almond oil, and macadamia grains. Together, the result is the most delicious, tropical scent ever! It instantly makes me feel like I am lounging on a sandy, tropical beach...rather than standing in my shower at some ungodly hour of the morning. The Neutrogena Body Clear Body Scrub in Pink Grapefruit has a great fresh and zingy scent that always wakes me up when I use it. I've never suffered from body acne, but I work out (and thus, sweat profusely) most days, so I like to use this on a shower puff with a long handle to make sure that I don't get any breakouts or clogged pores on my back. It also has tiny beads in it, so I like to think it exfoliates my skin on my back, as well. The Ojon Restorative Hair Treatment is something that I have spoken about before here. I've had it for ages and only use it on occasion, but it always helps revitalize my hair if it is dull or overprocessed. I imagine that many people will be put off by the scent (it smells of chocolate and pipe tobacco to me), but I love it. I normally apply it to wet hair in the shower and leave it in overnight (rinsing it out in the morning) if I have time. The scent will linger in your hair for a day or two, but the results are worth it for me. Lush Ro's Argan Body Conditioner is probably the most unique product out of the bunch. It is a rose-scented 'body conditioner' (aka lotion) that you apply all over while you are still in the shower. I normally put it on my limbs while I am conditioning my hair and let it sink into my skin for a few minutes before rinsing it off. In addition to argan oil, it has cocoa butter, cupuacu butter, and almond oil and is simply the most divine moisturizer. I slather it on and enjoy the rose scent on days when my skin is feeling extra dry, or after I've shaved my legs to avoid razor burn. It really does an excellent job of moisturizing and allows you to skip a step after you are out of the shower. What are your favorite items to use in the shower? i love ro's argan too! :) an SA in Lush told me to try it as a shaving cream too, but it is too precious to try it!